Author(s): Sibel Ilbasmis-Tamer, Department of Pharmaceutical Technology, Faculty of Pharmacy, Gazi University, 06330-Etiler, Ankara, Turkey. Ismail Tuncer Degim, Fusun Acarturk, Usama Alshana. Introduction: Parabens are widely used in many cosmetic formulations. Although there are some reports which correlate tumor growth with the use of parabens, available data on penetration through human skin is still not sufficient to fully understand their potential toxicity. The aim of this report is to investigate penetration properties of parabens through human skin. Methylparaben (MP), sodium methylparaben (NaMP), propylparaben (PP) and sodium propylparaben (NaPP) were selected as the most commonly used parabens in cosmetic formulations. 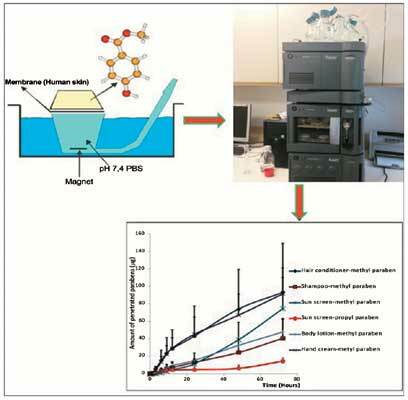 Methods and Materials: In addition to UPLC method, a simple and rapid method based on dispersive liquid-liquid microextraction (DLLME) prior to capillary electrophoresis (CE) was also developed for determination of parabens. Penetration properties of parabens through full thickness of human skin were determined using Franz diffusion cell. For saturated solutions, the flux values for MP, PP, NaMP and NaPP were found to be 9.36±3.36, 4.09±1.03, 121±19 and 15.4±0.2 µg/cm2h, respectively. Shampoo formulations gave a flux value of 0.545±0.271 µg/cm2h for MP. Results: The flux value of MP was found as 0.968±0.221 for hand cream, and MP and PP were 0.650±0.254 and 0.320±0.283 µg/cm2h, respectively for sunscreen formulations. The flux value of MP was found as 0.677±0.273 µg/cm2h for body lotion. The amount of penetrated parabens varied depending on the formulation. Hence, it was concluded that formulations should be investigated individually for paraben penetration and their possible toxic effect. Keywords: Parabens, human skin, UPLC, capillary electrophoresis, dispersive liquid-liquid microextraction. Affiliation:Department of Pharmaceutical Technology, Faculty of Pharmacy, Gazi University, 06330-Etiler, Ankara, Turkey. Keywords:Parabens, human skin, UPLC, capillary electrophoresis, dispersive liquid-liquid microextraction.